The Russian stood on the boat's bow wildly waving his arms and whistling loudly, urgently trying to attract attention. Was this an emergency? Were his boat and crew in danger? No. This man was arranging for our lunch. The man was Val Darkin, the location is around the islands of the former Soviet Far East, south of Vladivostok and this is part of a typical Russian diving adventure. An invitation from the Russian Academy of Sciences had brought me and Ed Ivey, Marketing Director for Quest Marine Video, to Vladivostok, Russia to work with the Institute of Marine Biology on a research expedition to the Kuril Islands. A free day before our departure allowed us to take advantage of an invitation from Val Darkin to become the first Americans to dive the Russian Far East! A resident of Vladivostok and former head of diving operations at the Institute of Marine Biology, Val Darkin is one of the new breed of Russian entrepreneurs seizing the opportunities, and risks, of capitalism and free enterprise. Val is hoping the novelty of diving in Russia will attract enough westerners to keep him busy in the summer months. Val has done his, homework. During visits to the U.S. Val has met, talked, and dived with dive boat operators in the Florida Keys and in California. Val has also acquired an impressive array of instructional certifications. This represents a lot of foresight on Val's part since, until recently, the city of Vladivostok was closed to tourists! As of January 1992, thanks to the changing political climate in Russia, you can now visit and dive around Vladivostok without fear of being arrested as a spy. 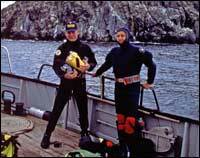 Our Russian diving adventure began when we arrived in Russia on Alaska Airlines. The nine hour night from Anchorage to Khabarovsk, Russia, included a boring two hour stop-over in Magadan, Russia, for an immigration cheek. The flight seemed even longer since we lost a day by crossing the international dale line. Arriving in Khabarovsk, near the Russian-Chinese border, we were, fortunately, able to skip the ordeal of a Russian customs check through the intervention of the Marine Institute. Once in Khabarovsk we still had another 500 miles to go to reach the coastal city of Vladivostok. There are normally two options in traveling to Vladivostok: flying Aeroflot or taking the train. We took neither. Instead, we spent the next 20 hours bouncing around in the back of a minibus, courtesy of the Marine Institute. While we saw some beautiful countryside with scattered forests and verdant rolling hills, I'm sure on the train we would have seen the same thing and been a lot more comfortable. When we finally reached Vladivostok we discovered a city similar in many ways to its American sister city, San Diego. Like San Diego, Vladivostok is a navy town with a beautiful harbor surrounded by rolling hills. We had a chance to better appreciate Vladivostok when Val gave us a quick city tour that included a stop on a hill overlooking the city with a panoramic view of the harbor. A small harbor on the west side of the point from the main harbor is where we boarded Val's boat, Vector. This sturdy 52 foot vessel is a former Polish trawler. 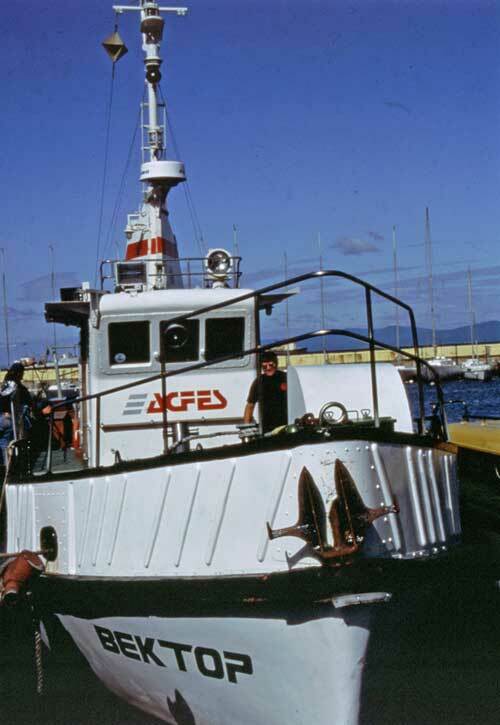 The boat is equipped for live-aboard diving and four divers, similar to a typical California dive boat. 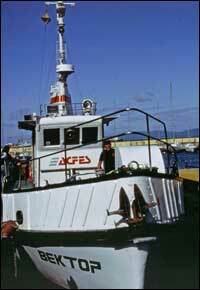 The carpeted bunk room has four single bunks and a small work table below deck, amidships. Directly behind the wheelhouse and at the top of the ladder from the bunk room, is the small but adequate galley. The wheelhouse is outfitted with western marine electronics, including radar, depth finder, satellite navigation and VHP radio. Two compressors below deck supply 3,000 psi air to steel tanks, lilted with yoke valves compatible with U.S. regulators. On the day of our dive trip, in late July, the weather was terrific... a warm 75°F with clear, sunny skies. With Victor piloting our boat around the numerous islands south of Vladivostok, Val provides commentary. Val points out a top secret military harbor. With cameras blazing it seems incredible that just a few months ago we could have been shot for this. Along the way Val shows us how he goes shopping for seafood. Val directs Victor toward a crab fishing boat up ahead. With a bottle of vodka in hand Val stands on the bow wildly waving and whistling. When we approach, the fishing boat stops and allows us to come alongside. Using a bottle of vodka the currency of choice in Russia. Val procures two large king crabs for our lunch. After a two and a half hour cruise we arrive at our destination, Zheltukhin Island. 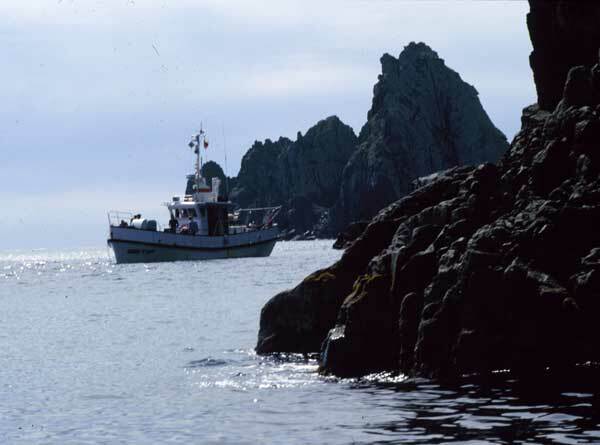 This is one of the sites Val visits on his multi-day cruises and he has chosen this location for us due to its proximity to Vladivostok and the variety of diving offered. 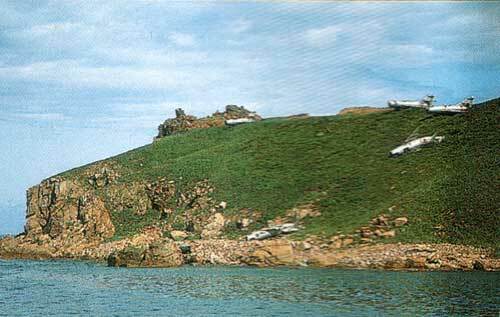 Zheltukhin Island is a small, quarter mile diameter rocky island. Sleep cliffs rise up to 30-80 feet above sea level and are home to hundreds of sea birds that lake flight, dotting the sky like pepper, at our approach. After suiting up, Victor drops Val, Ed and me off near the island about 100 feet away from the cliffs. 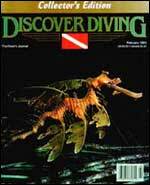 This dive is done as a drift dive, but today there is very little current. As we descend, a large purple and white jelly-fish slowly pulsates by. The water here is similar to California diving, 65°F with an emerald-green tint the marine life, though, is not like California. The steep rocky cliffs of the island descend underwater to a depth of about 150 feet, but we don't descend below 90 feet. The huge smooth boulders that are part of the cliffs are covered with life, unusual beige and brown, stalked anemones, off-white encrusting sponges, small purple sea urchins, large midnight blue mussels and giant white barnacles. Splashes of color are found in the form of green and orange bat stars, brick-red sea stars trimmed in royal blue, orange juvenile king crabs, and gigantic orange-red tunicates that reach about 12 inches in height. Sitting among the invertebrates and tunicates is an occasional rock fish. Swimming by are schools of various small fish. We are surprised by a brief visit by a curious gray seal. The visibility is about 40 feet, which could be due to the lack of current since Val later tells us the visibility here can reach up to 100 feet Our next dive is on a small (about 150 feet long) Japanese World War П destroyer that has been used for target practice by the Russian Navy. The ship has been blown in half and the superstructure has been obliterated. The bow is laying on its starboard side in about 80 feet of water and the stern is upright at about 15 feet. After this dive we take a welcome lunch break. We move to the sheltered bay of another small nearby island. While not as rocky as Zheltukhin Island, this island has more greenery and a nice strip of sand beach. As we draw nearer to the island we spot two Russian MIG jets on a ridge looking out to sea with three more MIG's poised on the slope below. On the beach is a tank and landing craft with other tanks along the slope pointing their guns out to sea in our direction. This isn't our welcoming committee or the set of the next Rambo movie. This military hardware served as target practice for the Russian Navy and now sits derelict and rusting. After lunch we return to Zheltukhin for our third and final dive. 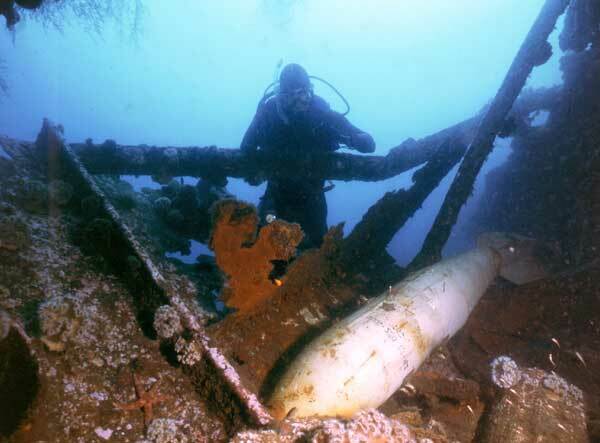 This is on another wreck, an American tug boat, left over from World War П as part of the American lend-lease program. This 90 foot long ship has also been a target for the Russian Navy and has been blown in half. 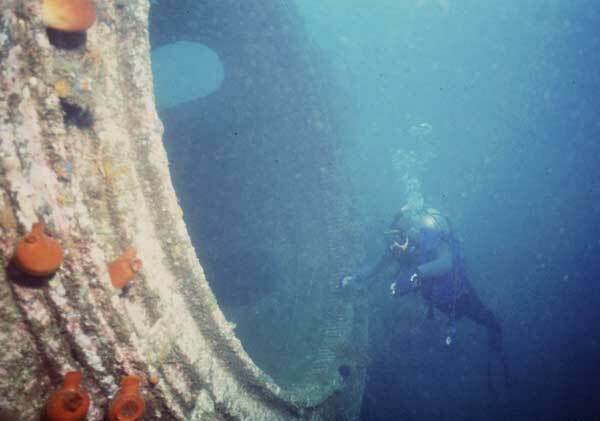 The stern sits upright in 65 feet of water. 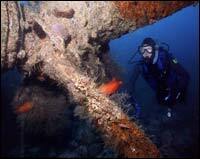 Its single prop is suspended off the bottom and is covered with gigantic red tunicates. Hiding in the rocks by the stern Val finds a juvenile octopus, about 18 inches long. I would normally consider this a good sized octopus, but here octopuses can weigh up to 80 pounds! Leaving the octopus, we investigate the wreck's interior, then return to the surface passing through a school of small, silvery bait fish. Obviously Russian diving isn't for everyone. You won't find warm water, coral reefs and unlimited visibility, but if you are the adventurous sort you will see things few inside or outside Russia have ever seen, and experience a people and culture that have been restricted to foreign access for most of our lifetimes. 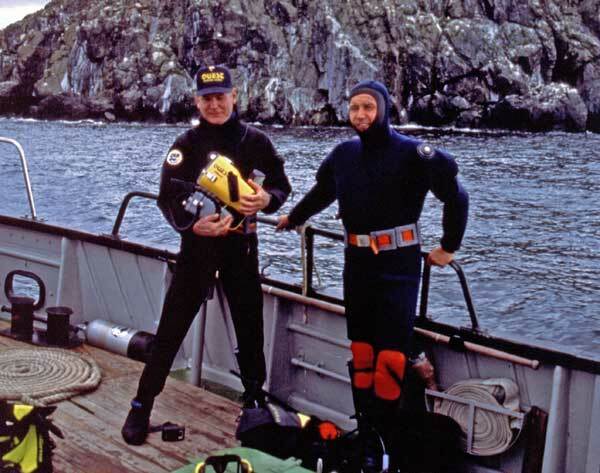 I look forward to returning to the Russian Far East to visit with the many friends I made during my stay and to join Val and Victor to explore other dive sites off his new 96-foot live-aboard.